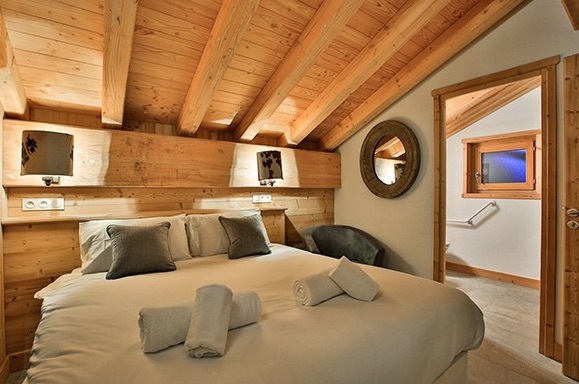 Chalet Iris Bleu is a member of the brand new “Mountain Flower” chalet complex. The location is superb, located just 100m from the nearest piste which is a blue piste that leads straight down to the Bergerie lift in Plagne Centre. From this point, you can head over to Plagne Bellecote or into the amazing skiing above Plagne Centre itself. At the end of the day you can ski back to the same point, just 100m from the chalet. Plagne Soleil has a small selection of shops and bars however the brighter lights of Plagne Centre easily reached by taking the Telebus gondola from Plagne Village. This lift runs in the evening too but be careful not to miss the last one home! Chalet Iris Bleu sleeps 8 guests in 4 en suite rooms, all of which can be configured as either a twin or a king size double. Please note that your room will be made up as a twin unless we are told otherwise. A superb new chalet in a great location.